It’s a little known fact outside of our country (as far as I can tell with Australian ignorance) that the Indian community are one of the three main races in Malaysia. This in some small way makes me feel like I have some affinity with their community. The Chinese New Years I knew as a child, featured bored mini-Sam watching countless of Tamil films with English subtitles in our house in Ipoh that had no cable television. And food, the main point of this post, Indian food is stuff I fantasise about. I mean, I probably even had my first mouthful of dahl before I ever had a nibble of steak. Truly, I don’t mean to boil down the history of an entire population to old static-riddled movies and food I happen to have eaten and I sincerely hope no one takes this in an offensive manner. The point I am trying to make here is that Indian culture is both foreign to me but also a comfort, for having grown alongside it all these years in Malaysia. The first time I ventured into the kitchen of my corridor in Sweden, I was knocked back by the smell of a corridormate making pratha right there and then from scratch and I could feel my knees grow weak and my eyes well up because Sweden was so goddamn cold and all I wanted was to have some too. Is it any wonder that I took to The Hundred-Foot Journey like kids take to murukku? Kudos to my mom for recommending this film to me. 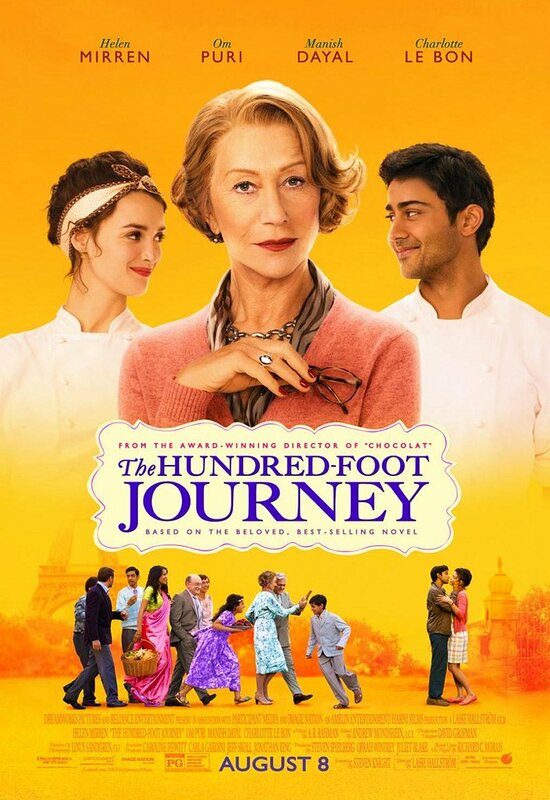 The Hundred-Foot Journey is one big story about juxtapositions. At its core it takes boisterous and colourful Indian food head-to-head against quietly sophisticated French food. It begins with a narrative told from Hassan Kadam’s perspective, the movies protagonist, on their way of life in India prior to losing everything including their mother in a fire. After deciding to move to Europe, their sense of family and comfort living in Mumbai is again contrasted against the sterile nature of a Dutch immigration station who not only undermines Hassan’s skill as a chef but their purpose for being in Europe. They even endorse stereotypes by asking Hassan’s sister, Mahira, if their true reason for being in Europe is an arranged marriage. Still despite the heart-wrenching loss within the first ten minutes of the film, the Kadam family seem largely happy to be wanderers guided only by the voice of their mother that Apa (Hassan’s father) claims to still hear in his heart. Soon the family finds themselves in quaint French countryside and upon chancing on a beautiful but neglected piece of property, Apa takes heed of the ‘sign’ of their car accident that this should be where they build their lives again. An Indian restaurant is quickly put up where Hassan will cook at, a restaurant which happens to be 100 feet away from a one Michelin star French restaurant owned by the cold and abrupt Madame Mallory. In the beginning when both cuisines are pitted against each other, their weaknesses show. Indian food seems over the top and clumsy, French food sterile and unable to fully satiate their patrons. But as the story develops and the worlds start to merge, putting them side-by-side seems to only bring out their strengths. The honesty in Hassan’s technique and the way he always uses his mother’s special spice pots, the intricate method to French cuisine and Madame Mallory’s delicate palate. Through overcoming different tribulations and growing up to hone vastly different skills, the truth shines. There is no one perfect way to cook. My favourite motif throughout the film is the way every character perceives Michelin stars, the ultimate honour bestowed to any restaurant. The Indian family had never heard about Michelin stars, the most adorable scene being when Hassan’s kid siblings ask if they each had their own Michelin star. This is contrasted against Mallory who has spent the last many years of her life obsessing over attaining a second star. It confronts me a little. As a food blogger I sometimes succumb to hype and the glitz of eating at a recognised establishment. I cannot imagine the pressure chefs of all tiers struggle with to not only want to attain stars or hats, but just with the approval of the mass population. What this motif has taught me is that validation can only come from within, and if you work hard and love what you do you’ll shine brighter than any old star. I truly hope everyone in the food and beverage industry knows and remembers this. You guys are all so, so great. I don’t want to give too much else away. There’s montages of hard work, macro shots of beautiful food preparation, light-hearted one liners by Apa (who very quickly became my favourite character) but most of all is the triumph of the human spirit to exhibit tolerance and acceptance, even for cultures that they do not understand. I am not Indian nor do I claim to be. But I am so, so grateful for my upbringing that gave me some understanding of their community. Heck, when asked to describe Malaysia as a dish with Flavours magazine, I chose to identify myself as dhosai. I know that food isn’t everything that culture stands on but as the movie and my experience has shown, a whole new world may lie only a hundred feet away but food can be your bridge to it.